In wealthy German cities, which have received tens of thousands of refugees from the Middle East and Northern Africa in recent years, officials have scrambled to provide adequate physical accommodation. In this paper, Nina Riewe explores refugees’ negotiation of space in an initial reception camp in Hamburg. Considered under law to be “dwelling” but not actually “living” there, they continually struggle to maintain privacy, sociability, and physical and psychological comfort in a place constructed on the ambiguity of their status. In recent years, Germany has experienced an extreme increase in new arrivals of refugees. Refugee movement has been triggered by the civil war in Syria, armed conflicts in Afghanistan, Congo, Mali and Somalia, as well as precarious economic situations in many African countries and in the western Balkans (UNHCR 2015, p. 4; Reimann 2016). In 2015 alone, 1 million refugees were registered in Germany, and 500,000 applied for asylum (BAMF 2016, p. 4). Germans have a constitutional duty to provide shelter to those looking for safety. Asylum seekers are distributed within the country in accordance with the Königsteiner Schlüssel law, which adjusts for tax income and the number of residents per region. This means that a densely populated city-state like Hamburg, with 1.7 million residents and a high tax income, is obliged to shelter more people than sparsely populated regions and/or regions with lower tax income (Asylgesetz 1992, §45). In 2015, Hamburg welcomed 2.5% of all arrivals to the country, corresponding to a total of 61,589 arrivals. Of these, 22,987 remained in the city (FHH 2016a). The rest were either sent to other federal states or were in transit to Scandinavia. During a period of one year in 2015/2016, my colleagues and I conducted a case study1 of an initial reception camp located in a vacant industrial building—a former meat-processing facility—in the south of Hamburg. Through the close observation of this camp and its various stages of transformation, we explored questions of living, dwelling, appropriation and control over space. Four main types of camps can be found in Hamburg: tents, wooden houses, containers and reused (vacant) buildings. Military tents, flanking the main railway station, were used to accommodate refugees at first. The state-run department Fördern & Wohnen (“Supporting & Living”) later set up shipping containers on unused fields, sports arenas, and parking lots. Vacant municipal or industrial buildings were also furnished with bunk beds with the help of the military and NGOs. Source: representation by the author based on information from Fördern & Wohnen and interviews (with O. Meyer-Sievers, 2016) conducted as part of the case study. Notes: arrivals peaked in October 2015 and declined in 2016 due to the closure of the “western Balkan route”. Source: graph by study co-author Johanna Londong based on FHH 2016a. During our research, we observed that the locations of the camps also depend partly on the definition of “living” in German law. The law does not classify refugee accommodations as residences because refugees, with their inherent lack of self-determination, are not considered to be “living” there. Their status is temporary (see Dossmann et al. 2006, p. 60); consequently, camps cannot be built on plots designated for residential use. Furthermore, lawsuits brought by residents complicate the set-up of initial reception camps in more central and/or residential areas. As a result, the majority of the initial reception camps are situated on the outskirts of Hamburg in commercial or industrial areas, often next to highways or railway tracks. Dossmann et al. (2006) point out that a camp does not require a specific architectural typology but can be implemented in any sort of already existing structure. A controllable and lockable site, clearly demarcated from the surrounding area, is sufficient. The suspension of privacy, a regulated range of movement and the ad hoc constitution of involuntary communities are also distinctive traits of camps. Mark Terkessidis (2013, p. 24), posits that locating the camps near places of transit is intended to remind the refugees that they are still on the move and have not arrived yet. Marc Augé has called locations like refugee camps “non-places”, serving the accelerated transit of people and goods (Augé 1993, p. 44). Agamben (2002) employs the term “state of exception” to denote the political conditions under which, due to an extraordinary suspension of rights and norms, people may be considered to be dwelling in places but not living in them. 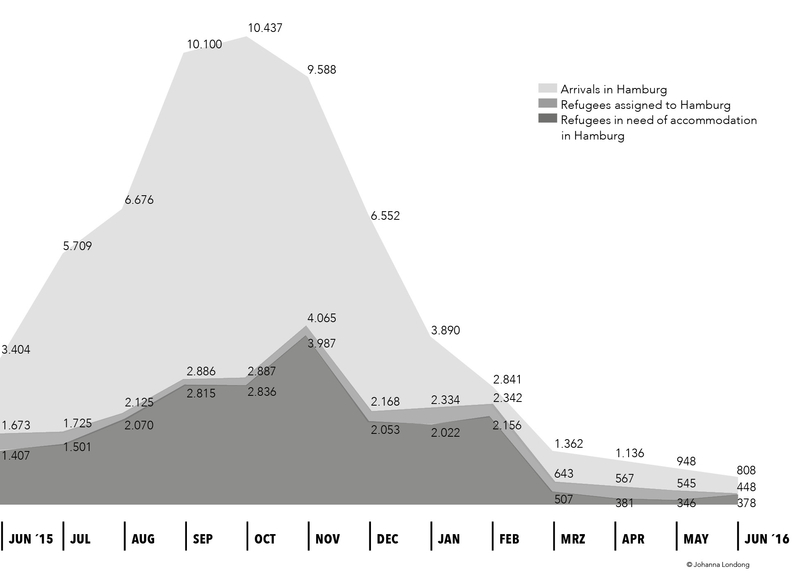 Up until 2015, under German asylum law, the maximum length of stay in an initial reception camp was not to exceed three months. In August 2015, legislation prolonged this period to six months (Die Zeit 2015). Follow-up accommodations, built by private companies and rented by the state, are legally designated for “living” according to German law, providing accommodation to refugees until they are able to find their own housing (or until they are denied asylum and deported). Nevertheless, although the new legal framework has allowed a prolonged stay in the initial reception camps, 10,000 refugees who should have already been granted places in follow-up accommodations were still living in reception camps in June 2016 (Bürgerschaft Hamburg 2016). What happens when temporary solutions are used much longer than predicted and when structures not designed to be lived in are stretched to their limits? Notes: in June 2016, there were 39 camps, a majority of which are situated in the outer districts of Hamburg. Source: map by case-study co-author Johanna Londong based on FHH 2016b. Source: illustration by co-author Johanna Londong, based on her own survey. Near Harburg railway station, in the southernmost part of Hamburg, hidden behind a hardware store, 900 refugees were accommodated by the German Red Cross in September 2015. Located in a former meat-processing facility, the camp was set up literally overnight by the German Red Cross. In November 2015, social workers let us observe the camp. We visited its residents for a period of nine months, which gave us an insight into the spatial and social transformations of the camp. The new residents were confronted with minimal services upon arrival. The main hall was equipped with bunk beds, benches and tables. Food was and still is delivered from an external catering company and heated up in the camp. Social workers took care of personal matters while the management of the camp took care of bureaucratic matters and the asylum process. External security guards protected the camps from outsiders and reconciled disputes among the residents. There were no washing machines, and laundry had to be done in the showers or in a neighbouring camp once a week. During this time, Mohammad was our main contact. He was introduced to us by a social worker. He had fled Iran in the summer of 2015 and, because of his fluent level of (self-taught) English, he soon became an asset to the social workers in the camp, interpreting from Persian to English and back. We met Mohammad on almost all our visits to the camp and remained in contact even when he was transferred to another camp in Hamburg. In early September 2016, his request for asylum was granted. In the very beginning, the beds stood in rows, forming corridors in the main hall. But the new residents soon appropriated this space. They rearranged the beds into small groups, forming courtyards and small blocks. The overall groupings were based on nationalities or language groups, while smaller groupings within these were formed along lines of friendships or family structures. Using donated bed sheets or fabric, people separated the bunk beds from one another to create some degree of privacy. One of the residents of the camp invited us in November 2015 to his improvised home within the camp, which he shared with two friends. The three men occupied two double bunk beds but only two of them slept in them. Our host told us that the cots were too uncomfortable to sleep in because of their narrowness and steel structure without mattresses. He had made his bed on the floor, out of blankets and fabric. A bench taken from the general dining area was used as a table and shelf to store water and dry ingredients. The upper level of the bunk beds was used to store clothes and other personal belongings. These spatial arrangements created some privacy for their inhabitants, but they did not shield them from the noise in the hall. Our host told us that he was careful with conversations because the neighbours could hear them through the thin fabric. These home spaces were open and everyone could enter during the day. Many items were reported stolen during the residents’ absences. As a consequence, it was impossible to keep personal belongings or valuable articles safe. Notes: the residents arranged their beds, creating small units with family members or friends whereas the overall grouping derived according to nationalities or language groups. Source: drawing by the author based on her own survey and interviews (with M. Radan, 2015, and A. Aleksieva, 2015) conducted as part of the case study. Notes: under the pretense of diminishing hygienic conditions, the self-determined constellations of beds and people were disassembled. Source: drawing by the author based on her own survey and interviews (with M. Radan, 2016) conducted as part of the case study. Two months after our visit, the camp was transformed. The clustered beds were separated, and put back in rows. Security guards cut the cloth partitions in between the beds. According to a guard, residents were taking food into their homes, which lead to unhygienic conditions. The minimal comfort of the residents was sacrificed for the sake of salubrity. Mohammad had been in the camp for five months now. Social workers had prevented his transfer to another, better-equipped, camp because his services as an interpreter were needed. He held one of the “€1 jobs” (paying €1 per hour), which not many residents of the camp had the chance to obtain. In his case, this rather symbolic payment was changed into a membership of a gym nearby, which was not just a place for exercise, but also replaced the hygiene facilities at the camp. At the same time time, aid infrastructures developed around the camp, and volunteers found their way into the former meat-processing facility. Language courses, cafés and activities were offered; locales were used and set up for refugees. There were three different types of space around the camp: (1) pre‑existing institutions, such as the public library or community colleges, which extended their services, offering language courses; (2) newly founded places like refugee cafés, enabling contacts between refugees and residents; and (3) spaces like parks, squares or shopping malls, freely accessible and most of them without the pressure of consumption. This network of places is key to understanding the dynamics of the camp. They are extensions that complement the basic services provided inside the camp. A few months later, in February 2016. the camp changed again. According to management, this was the final stage of transformation, planned from the beginning but not feasible until then because of a shortage of supplies. The hall was segmented with partition walls, forming compartments, which could host up to 12 people. The walls, made out of cardboard, were unstable and noise-permeable. They only shielded the refugees from side glances, but not from surveillance from above by the security guards who were able to overlook the hall from a gallery. These new structures were adapted by the residents. Beds were moved and shielded with fabric; scarves converted into cloth lines crossed the compartments. Residents moved from their allocated compartments to those of family members or friends. Vacated compartments could then be used for other purposes. For the first time, the residents had an address. They were not called via speaker any more. Instead, mail was sent to their compartment number. The parking lot outside of the camp was used to accommodate classrooms in temporary structures, a street soccer field under the canopy of the main hall, and integration classes in donated tents. Sometimes, people cooked under the canopy, using electricity from temporary structures built for other purposes. Over and over again, the residents appropriated rigid spatial structures aimed at controlling them. Negotiation of power became usual in the camp as refugees waited for decisions about whether they could move from “dwelling” to “living”. During this period, a spatial reversal occurred: practices of “living” ordinarily performed in an apartments—eating, intimate care-giving, socializing—took place in the neighbourhood, while services typically provided in the public realm, such as schooling, provision of medical care, and recreation, were brought into the camp. Soon, this use of the camp as a temporary dwelling place for asylum seekers came to an end. The residents were moved in March 2017 to other reception camps or follow-up accommodations, depending on their asylum status. Mohammad, our contact, was later granted asylum and to the latest of our knowledge is still living in a reception camp. As for the former meat-processing facility, it took on another state of exception: it was a temporary prison during the G20 summit in July 2017. Agamben, G. 2002. Homo sacer: Die souveräne Macht und das nackte Leben, Frankfurt am Main: Suhrkamp. Augé, M. 1994. Orte und Nicht-Orte: Vorüberlegungen zu einer Ethnologie der Einsamkeit, Frankfurt am Main: Fischer. Bundesamt für Migration und Flüchtlinge (BAMF). 2016. BAMF Aktuelle Zahlen zu Asyl. Bürgerschaft Hamburg. 2016. Bürgerschaft Hamburg Schriftliche Kleine Anfrage der Abgeordneten Karin Prien und Dietrich Wersich (CDU) vom 03.08.16 und Antwort des Senats Betr. : Überresidenten – Beschulung von Flüchtlingskindern. Die Zeit. 2015. “De Maizière will Asyl-Gesetze verschärfen”. Dossmann, A., Wenzel, J. and Wenzel, K. 2006. Architektur auf Zeit: Baracken, Pavillons, Container, Berlin: B_books. Freie und Hansestadt Hamburg (FHH). 2016a. Daten zur Zuwanderung. Freie und Hansestadt Hamburg (FHH). 2016b. Hamburger Flüchtlingsunterkünfte. Herz, M. 2013. From Camp to City: Refugee Camps of the Western Sahara, Basel: ETH Studio. Reimann, A. 2016. Endlich verständlich: Fakten zur Flüchtlingskrise. Terkessidis, M. 2013. Interkultur, Berlin: Suhrkamp. United Nations High Commissioner for Refugees (UNHCR). 2015. UNHCR Mid-Year Trends 2015. Navigating the City–State Divide: What’s Next for Progressive Elected Officials?